To devote radio technology for the war effort, In 1917 the U.S. Government took charge of the radio's manufacture company's patents. Although the Federal Government stopped the monopoly of Radio Communication, but The War and Navy Departments still want to build a national radio system for the United States. Admiral W. H. G. Bullard and Captain Stanford C. Hooper talked to executives of the General Electric Corporation (G.E.) and asked them to cancel the sale of high power radio transmitter to Marcony Company. June 29, 1932: NBC Blue network had its premier airing of Vic and Sade. Vic and Sade was written by Paul Rhymer. 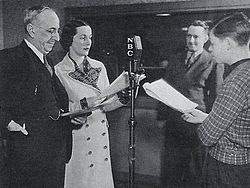 It was an American daily radio program that broadcast from 1932 to 1944, then intermittently until 1946, and was briefly adopted to television in 1949 and again in 1957. Vic and Sade became one of the most popular series of its kind along its 14 years broadcast on radio. The program has got many critics and complement for its success. Vic and Sade usually aired for 15 minutes as with un-continually stories. The main role was known as ""radio's home folks,"" were featured Art Van Harvey as Victor Rodney Gook, Bernadine Flynn as his wife Sade and Bill Idelson as the adopted son. The family lived on Virginia Avenue. The story was plotted naturally and ease, and Rhymer also put some humorous dialog that was delivered with a subtleness. The program described most outrageous events seem commonplace and normal.